How can I test whether Dorsal Raphe Nucleus (DRN) activity at night is related to variations in mood? The paper above referenced this excellent paper on how DRN is involved in the regulation of motor activity, and even includes some references to how DRN is involved in the sleep/wake cycle. Here's an example of a graph from the article above. 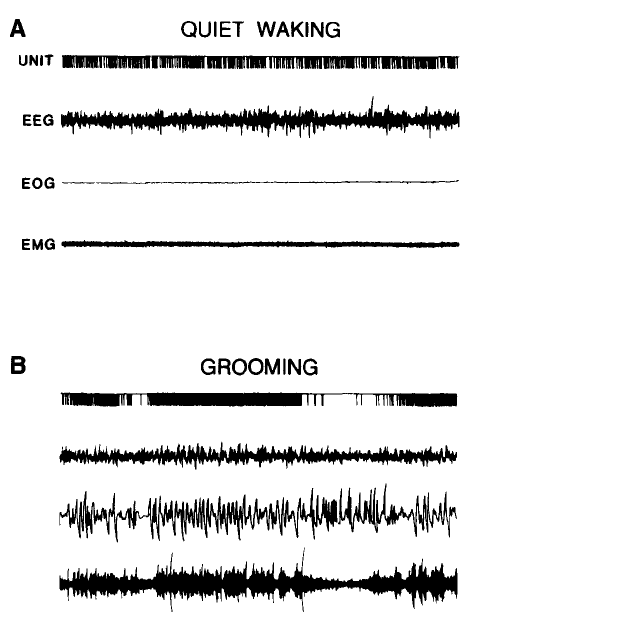 It shows how the firing rate of the DRN increases in response to cat's grooming, compared to quiet wakefulness. DRN firing pattern changes in response to movement. Can I reverse this statement to say that movement indicates DRN activity? The hypothesis that I have is that if less Serotonin is available in the DRN as a result of depression, the activity of the DRN as related to motion at night would be different from the normal person. I hypothesize that by observing the motion of human in bed at night, it may be possible to quantify the activity of DRN, potentially using this information to predict mood fluctuations. Here's my train of thought - DRN fires differently in response to motion, and motion is accompanied by DRN firing, while muscle atonia is accompanied by total lack of firing. An actigraph has shown that a person (myself and others) moves over the course of the night, in bursts with episodes of total stillness and episodes of burst activity. People move differently in different sleep stages. 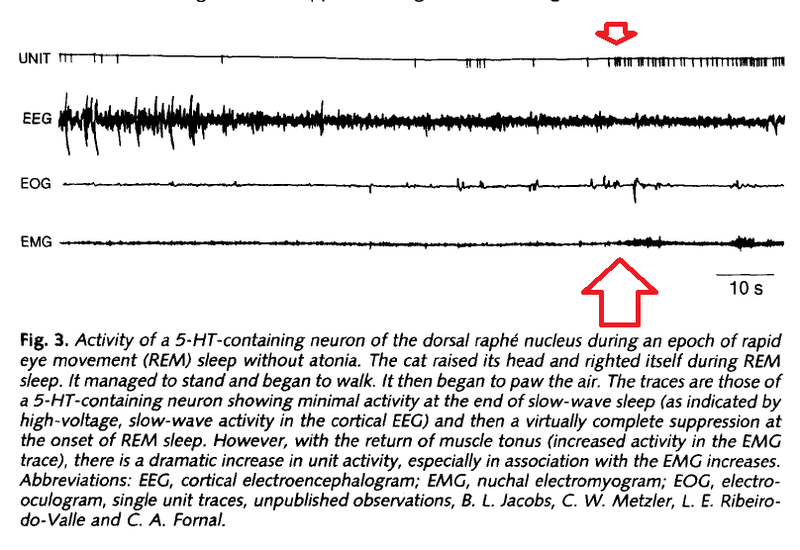 In cats without atonia (see figure below), DRN gets activated when Rapid Eye Movement(REM) sleep is detected, in response to the cat's actions within the dream, similar to the waking state.. 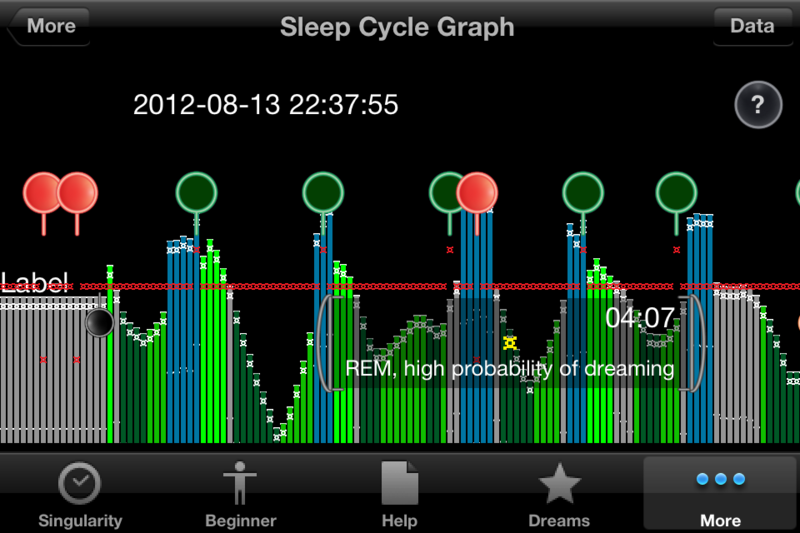 Normally, DRN shows absolutely no firing pattern during REM sleep. I would like to examine the pattern of movement over night and compare it to the feeling of well being in subsequent days, where depression can be linked to decreased levels of Serotonin in DRN cells. If I understand the Bursts and the Efficacy of Selective Serotonin Reuptake Inhibitors paper correctly, bursts of electrical activity within the DRN alter Serotonin concentrations for some time after the burst. As such, it seems to me that bursts of electrical activity associated with motion (a typical motion at night is 3-10 seconds) with a large motion observed every 2-3 minutes over the 20 or so minute period that preceedes awakening would have an impact on the Serotonin concentration in the DRN. I'm trying to understand if activation of Dorsal Raphe Nucleus during Rapid Eye Movement sleep can be detected with an iPhone actigraph, and if this activation can be quantified, measured and correlated to behavior in the preceeding and subsequent few days. I'm looking to correlate activation of DRN or lack of thereof with the normal, elevated or depressed moods and activity patterns. An iPhone actigraph measures gross motor activity, which I guess would roughly compare to the EMG from the images above. In this case, the plot is logarithmic, with taller redder bars being orders of magnitude bigger than the baseline "noise" observed by the device. Over the past year I've been working on an iPhone actigraph - an app that analyzes user's motion and can be used for sleep studies. 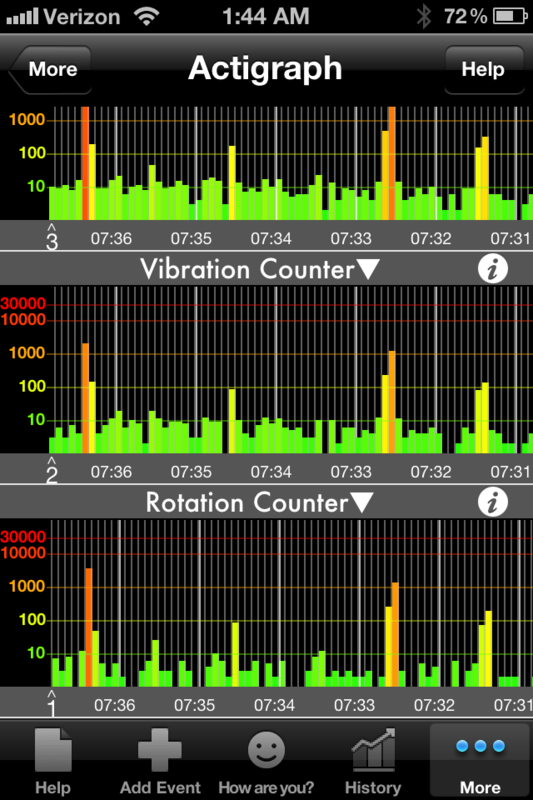 On that actigraph, I'm seeing spikes in motion (my sleep) at different sleep phases. The device allows marking of events over night - midnight awakenings, and dream awakenings. Here's an example of a sleep cycle graph that is drawn based on the observed motion at night. In this case, the deeper the graph, the more still the person is. Red circles indicate insomnia, green circles indicate subsequent dream awakenings. The device also allows the user to track moods over the course of the day with a very cool Pick A Mood scale and add different events, such as meals, exercise and over 80 other types of events. Since I'm only an amateur at science and sleep studies, what are your thoughts on the train of thought above? Is there any merit to the hypothesis? How would I go about testing it with the technology I outlined? To start my post with a cliche - correlation (between raphe activity and movement) does not imply causality. More importantly, the complete absence of the raphe nucleus does not negate movement. Can I reverse this statement to say that movement indicates DRN activity? I would be careful with this statement. Activity in the raphe nucleus is positively correlated with behavioral arousal, yes (Ranade & Mainen, 2009). Further, raphe activity is thought to be related to the level of tonic motor activity associated with gross motor activity and repetitive, central pattern generator mediated responses (Jacobs & Fomal, 1997). Yet, to couple these findings in reverse, and state that one can measure raphe activity through movement detection is tricky. Importantly, there are hosts of studies where the raphe nucleus was ablated and animals still showed (quite normal) motor activity (e.g. Ghaderi et al. (2012)). I would like to examine the pattern of movement over night and compare it to the feeling of well being in subsequent days. serotonin (Todder et al., 2009). Indeed, the motor system is regulated more directly through dopaminergic neurons (think Parkinson). what are your thoughts on the train of thought above? Is there any merit to the hypothesis? I think there is merit, but using movement detection with an iphone app, and thinking that a correlation between movement and serotonin signalling implies a causal relation between raphe activity and movement is dodgy. You have to prove this first, either by a solid literature search or through experimental investigation and find support for your hypothesis. Not the answer you're looking for? Browse other questions tagged neuroscience theoretical-neuroscience mood or ask your own question. What does daytime actigraphy reveal about an active and awake brain? Is happiness a result of cognitive or a side effect of neurobiological processes? How to read a neuron tuning curve graph? Can positive self-affirmation improve mood? Is movement/activity level related to serotonin availability or reuptake rates in the brain? How do brain zaps occur?